Just about every election year, I watch in amazement as an unbelievable number of people in America vote against their own best economic interests. Likewise, in just about every election year, I turn to my wife and say, “What the hell is wrong with these people?” My reaction is not based solely on my left-leaning political views or on some bizarre desire to smear conservatives. My reaction is derived from simply paying attention to what politicians do once in office, for whom they seem to be working, and my genuine shock at who votes for them, given what they habitually do. Knowing what little I do about human nature, I can tell you without hesitation that behavior is always functional in the mind of the individual. Even the behavior of people with, say, schizophrenia. It may seem strange to us, but their behavior makes functional sense to them. So, armed with this universal truth, I set out to find out how middle-class and poor people come to believe it is functional behavior for them to vote against their own economic self-interest. It’s no secret that right-wing politics and fundamentalist Christianity are joined at the hip. Watching their bizarre, contradictory, and often hypocritical dance is like watching a train wreck. You don’t want to watch, but you can’t look away. Mostly, though, the GOP mission is to do whatever the evangelicals set before them. They are dependent, after all, on the evangelical vote to have even a chance at getting re- elected. More than any other factor, it is the faith and beliefs of the individual that control the hand of the poor and middle-class voter. Even if you know little to nothing about the Bible, you know that many sins can get you sent to hell. Religious fundamentalists will tell you that being gay will doom you, or supporting pro-choice initiatives, or voting for the politicians who support pro-choice or pro-equality policies. Even if national and local politicians and their supporters don’t come right out and say it -- “You’re going to hell if you vote for a Democrat” -- it’s always implied. The most recent addition to this propaganda is a "godly" victimhood -- “The Christian faith is under attack.” "There's a war on Christmas!" "They won't let our kids pray in school!" Etc. Much of this is spread by Christian pastors. While people may be suspicious of most politicians, regardless of their stripes, they trust their pastors. Most all of the religious leaders I’ve met in my life have been good, caring, and compassionate people. They're also human and subject to their own biases. Whether unwittingly or with full knowledge, some pastors have become enablers of an impoverished status quo. Because they preach hell-fire against what's "worldly," they cut off many pathways to economic help, including education. These statements may seem ludicrous to many of you. You may think to yourself, “That’s ridiculous. Our pastor would never be so cruel or hard-hearted.” But by presenting one political party as the party of God and the other as godless, many preachers, especially in the South, quite literally block the possibilities of positive economic change. Why would a pastor encourage his/her congregation to vote for a candidate who opposes health insurance for those desperate for it? Why would pastors encourage votes for a candidate who'll pander to the wealthy while ignoring the needy? Why don't pastors offer this guidance -- “Do what is best for your family. God loves you and knows you love him. Honor him by caring for those you love and by doing what is best for your family”? 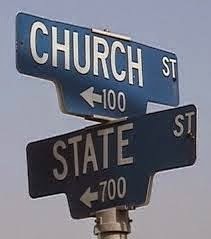 Even though the Christian faithful may not agree with reactionary policies on welfare, schools, sales taxes, or healthcare, by appointing themselves the “Party of God,” Republicans have forced Christians across the nation into a moral corner. Fear of being ostracized from the church family weighs heavily on its members. Fear of the devil, of those "who do evil against us," is potent. Until more church-goers see the evils in politicizing the church, of using fear as a political wedge, the Republican Party will likely go on owning the pulpit. I would rather follow the teachings of Jesus than any right-wing scree. To wit: feed the hungry, clothe the naked, care for children and the poor. Love your neighbor as yourself.